If I had a pub this is totally the type of dish I'd serve as cold weather pub grub. 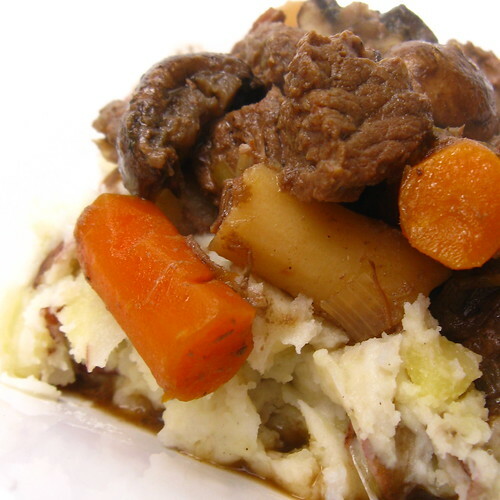 Hearty beef stew cooked in Guinness over a bed of creamy mashed potatoes. It would be especially good if you could eat it in front of a roaring fire with a nice pint of beer to wash it all down. The stew is cooked all day in a crock pot which makes for little hands on time. I choose to sear my meat before adding it to the crock pot. I know it adds a little more prep time & an extra pot to clean but, I find I like the texture of the meat better after this step & the flour in this step helps thicken the stew a little. Heat the olive oil over medium-high heat in a skillet. Put the stew beef in a plastic bag, add the flour & some salt & pepper then shake to coat the beef. Cook the beef in the hot skillet until brown on all sides. Move the beef to a crock pot. Pour about 1/4 - 1/2 cup of the Guinness into the hot skillet & bring to a boil to remove any brown bits from the bottom of the pan. Pour over the beef in the crock pot. Add the carrots, parsnips and leeks to the crock pot. Add the remaining Guinness, thyme, marjoram & bay leaf. Cover & turn the crock pot to low. Let cook 5 - 6 hours until the vegetables are tender & the meat is falling apart. Add the mushrooms & cook for 1 more hour. (If you feel the stew is a little thin, turn the crock pot to high & remove the lid for the last hour, this will help reduce it). Check for seasoning & add salt & pepper to taste. Serve the stew over hot mashed potatoes. pub grub. i do love a rhyme. great stew--hearty, warming, nutritious. i especially love the fact that it's served atop mashed taters! Such a perfect winter comfort food! I wish more pubs did serve this kind of meal. Guinness is a wonderful ingredient for stew. Something magical happens. Made this tonight in my gifted crockpot since my stove won't be here until Friday. It was absolutely delicious. Thanks for saving me from most crockpot recipes, which I find suspect.